Metal detectors could be installed at some schools in England as part of a drive to reduce knife crime. 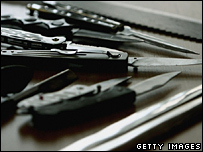 Schools were given the legal right to search pupils suspected of carrying knives in 2006, and a few are thought to have brought in detectors. But a Home Office plan to deal with violent behaviour is due to be announced next month. Head teachers say very few schools will take advantage of the powers, as most are peaceful and well-ordered. Home Secretary Jacqui Smith told BBC One's the Andrew Marr show: "I think that it's a good idea if we look at the ways in which in some schools it might be appropriate to use search arches - because I want young people to know that it doesn't make them safer to carry a knife. "It actually makes them more likely to be a victim." The comments came in the wake of outcry over the murder of father of two Garry Newlove who was killed by a group of teenagers who had been drinking. Ms Smith said the government was also looking at whether pricing and promotion had an influence on young people's drinking habits. Shadow Home Secretary David Davis said the installation of scanners in some schools was "long overdue". "The powers have existed for some time and we have been calling for this for some time. However, while there are hundreds of scanners there are thousands of schools. "We hope that - for a change - this initiative actually makes it beyond the front page." Chris Huhne, for the Liberal Democrats, said the move was "sad but necessary" and urged greater use of stop and search powers to combat knife crime. John Bangs, of the National Union of Teachers, also broadly welcomed the plan, but stressed it would only be appropriate for a small number of schools where gang violence was a problem. "It should be part of the armoury of keeping schools secure, when the head is worried about gangs outside," he said. He said he was aware of a small number of schools, including one primary school, which already had scanners. The general secretary of the Association of School and College Leaders, John Dunford, said: "Most schools will still prefer to call in police to do searches if there is a suspicion of weapons, but a small minority will want to make direct use of search arches or the recently new powers for staff to conduct searches." Margaret Morrissey, of the National Confederation of Parent Teacher Associations, told BBC Five Live's The Weekend News that "obviously and sadly" such measures were needed. But she raised concerns about the safety of those responsible for taking knives away from young people. "There's got to be a very secure back-up to this idea," she said. A Home Office spokesman said: "More detail will be available in the Tackling Violence Action Plan which the home secretary will publish in the next few weeks. "We are continuing to tackle knife crime through responsive policing, and prevention projects which provide diversionary activities, training, peer mentoring and education projects."